What Is Revain (R) Cryptocurrency? Revain is an honest review platform for the blockchain era. Powered by blockchain technology, it prevents stakeholders from tampering and deleting unfavorable reviews, and rewards users for quality feedback. 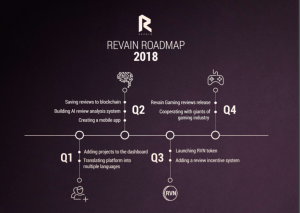 Revain is a blockchain-based feedback platform which rewards its users for valuable reviews. Its slogan reflects its mission - “reinventing reviews.” The project competes with the likes of Trustpilot, Yelp or Angie’s List. Traditional online review platforms face many issues, including fake accounts, spam, paid reviews, and others. Revain seeks to filter through the noise and make online reviews as fair and unbiased as possible. The project has already released V1.1.0 of its platform; thus anyone can try and earn cryptocurrency for sharing experiences. At the moment, you can assess cryptocurrency projects, exchanges, and wallets. Revain uses of blockchain technology to ensure the platform’s decentralization, immutability, and to incentivize users. On top of that, the reviews undergo a comprehensive, IBM Watson AI enhanced screening process to identify fake and malicious reviews and prevent them from publishing. Also, Revain uses the Ethereum blockchain to record snapshots of the original reviews so that they cannot be changed or deleted over time. 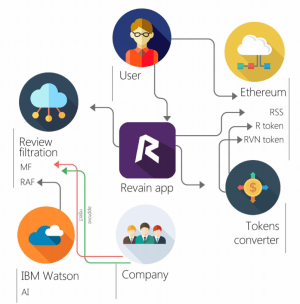 The Revain ecosystem utilizes a couple of cryptocurrencies: R and RVN. RVN is a stable coin which circulates in the Revain network only. Its sole purpose is to reward review authors for their work. R is the external token which can be traded on cryptocurrency exchanges. Revain uses a non-linear conversion mechanism to convert R to RVN and vice versa. It’s important to note RVN has nothing to do with Ravencoin (RVN) project, which uses the same ticker. Revain’s RVN tokens cannot circulate in the open market, while Ravencoins do. Ravencoin is a different network, designed for the efficient transfer of assets between the parties, and has nothing to do with reviews. Quality Feedback. Filtering fake and unreliable reviews helps cultivate trust between consumers and businesses. Also, it revamps the online reviews sector. Rewards. Users are incentivized to give honest and constructive feedback. Unbiased system. Revain system is completely decentralized. It doesn’t require users to trust the platform for justice. What Problem Does Revain Solve? Online reviews market is the Wild West where users, businesses, and marketers fight to boost their image and diminish competitors. However, why all the fuss? Online reviews are a force to reckon with. According to Local Consumer Review Survey 2018, 86% of consumers read online reviews regularly, and 91% of them trust them as much as personal recommendations. Simply put, excellent online feedback means money. Reading reviews is a crucial part of consumer journey and can either make or break deals. That gives businesses, salespeople, marketers, bot makers, and paid review writers enough motivation to skew the reality as much they can for their own benefit. Revain ecosystem consists of several key components, rules, and processes. They ensure credibility of the reviews posted on the platform. For instance, every user who wants to obtain rewards must first pass KYC application. Also, a regular user is limited to posting five reviews a day. However, project managers mention the possibility that this number will be increased for the most reputable reviewers. 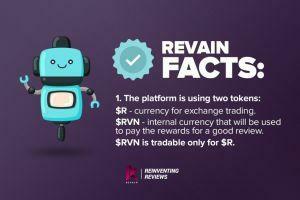 How Does Revain Reward System Work? Only listed companies can grant users RVN tokens for on-point and high-quality reviews. The award can vary from 0.1 to 100 RVN. You also get 0.1 RVN from Revain for your first approved review. Some users have reported not receiving RVN tokens despite stellar reviews. It is because Revain still doesn’t have a strong partner network, and not many companies are interested in doing rewards just yet. The situation should change over time. Revain itself doesn’t award RVN because the platform creators see an issue in rewarding tokens themselves. If the project did so, most of the reviews would be written about it, which isn’t the goal of the project. Revain’s Review Automatic Filtering (RAF) technology is the key component of the platform. It automatically filters unsuitable reviews to cleanse the platform from bots, spam, poorly written, and deceitful messages. 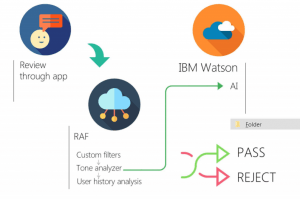 The RAF consists of IBM’s Watson Tone Analyzer service, custom filters, and analysis of user history. Revain user review posting process has three steps. When a review is written and submitted, it goes through Revain’s proprietary RAF system. It filters fallacious and poorly written user reviews, spam, fake reviews, abusive comments, and other content which doesn’t generate value. If the review makes the cut, it’s sent to the corresponding organization for manual approval. The service provider either accepts or rejects the review. If the review is denied, the organization must explain why and the response is displayed alongside the review. Such procedure helps to vet fabricated reviews. If the business rejects the review, a user can file a dispute. Revain employs a centralized panel of high-profile, highly-rated individuals called Oracles. If the original review is deemed valid by the Oracles, the user gets a reward, and the company receives a warning. If Revain issues the company three warnings, it is banned from the platform. All approved reviews are displayed on the business page directory. Afterward, they are saved as a Review Snapshots Storage (RSS) and are secured by the Ethereum blockchain. If RAF rejects three user reviews during a two-week period. If businesses reject five or more user reviews in two weeks. Users can collect three warnings. Upon fourth warning, the user is blocked from the system and cannot withdraw any earnings. How Does Revain Store Reviews On The Blockchain? Revain stores a snapshot of the original review on-chain because storing entire files on The Ethereum network isn’t economically feasible. In the whitepaper, the company states it tested more than ten different blockchains (Bitcoin, Emercoin, Storj, and SiaCoin, to name a few) to find a suitable solution, but none of them are capable of holding large amounts of data yet. 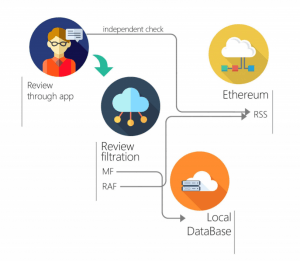 To remain integral and decentralized, Revain has implemented the Review Snapshot feature. Instead of storing an entire review, it sacrifices its structure and stores a simplified version on-chain. Any user can check the reviews using a contract with unique identifiers of the user and the company. Revain puts all projects in their respective categories and ranks them according to a custom algorithm, which weights their popularity and impressions. Every active network user influences these rankings. Companies from purchasing reviews. Although the company makes it extra difficult to buy fake reviews through the platform, it’s still possible to strike deals outside of it. Users attempting to earn cryptocurrency by posting made up reviews. Although a user can post only five reviews a day, and companies can reject reviews that seem fake, the company has no reason (apart from ethical conduct) to reject positive fake reviews. What Is Revain R Token? Revain (R) is an ERC-20 token issued on the Ethereum network. 484,450,000 R tokens are issued in total. The peak price of the token has reached $3.40 on February 13, 2018. The Revain crowdsale lasted from August 21 to September 4, 2017. The team has managed to sell 263,500,000 R tokens out of 700,000,000. At the time it was worth over $12,5 million and surpassed its soft cap of 2000 BTC. The ICO price per token was $0.05. 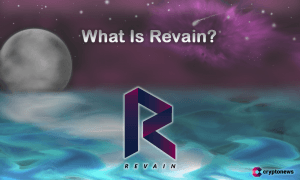 What Is Revain RVN Token? RVN is the platform’s inner token and can only be used in the native system. Every RVN token is backed by 1 USD (1 RVN = 1 USD), thus making it a stablecoin. However, if you want to trade RVN in the open market, you must convert it to R tokens first. Rewarding users for valuable reviews. Debiting companies for written reviews. Penalizing businesses for unconstructive moderation of reviews. Penalizing users for violating the platform rules. In the future, RVN will be used to buy services within the Revain Platform. Withdrawal function for the R tokens isn’t released yet but will be available in the future. What’s The Difference Between Revain’s R and RVN? Simply put, the R token is meant to enable users to trade their earned RVN. The RVN token can be exchanged for R and the other way around. Where To Buy Revain (R) Cryptocurrency? KuCoin, HitBTC (paired with BTC, ETH). BTC-Alpha, Mercatox (paired with BTC). DragonEX, BitForex (paired with USDT). Cryptopia (paired with BTC, LTC, DOGE). Where To Store Revain (R) Cryptocurrency? Revain can be stored in any Ethereum wallet which supports ERC-20 standard. The most popular options include MyEtherWallet, Mist, Trezor, or Ledger wallets. Revain is a Russian-based startup lead by Rinat Arslanov. He is a renown entrepreneur with over ten years experience in venture capital, business, and blockchain. Other essential members of the team are COO Alexey Belashenko, who’s responsible for managing Revain’s day-to-day operations. Alexey Abramov is the projects head of development. 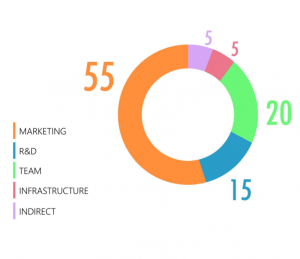 Currently, the Revain team consists of at least 14 full-time employees. For a complete and up-to-date list of Revain team members, see the project's website. In the past year, the Revain team has made significant progress - launched Revain platform V1.0, issued RVN tokens, acquired many partnerships, and tested many new platform features, including platform redesign. In the most recent news, they have added wallets review category to their platform. However, the company fell short on some of its 2018 roadmap goals, too. For example, the mobile app is still nowhere to be found. Gaming reviews and industry cooperations are also yet to be fulfilled. Despite the incongruencies, Revain was one of the best-performing projects in the last quarter of 2018. The team is engaged in the project activities and delivers on most of the promises. Steem (STEEM) - A blockchain-based social media ecosystem allowing content creators to earn cryptocurrency. Basic Attention Token (BAT) - a new token meant to be exchanged between publishers, advertisers, and users to improve the efficiency of digital advertising. Mithril (MITH) - a decentralized social media platform on the Ethereum Blockchain.